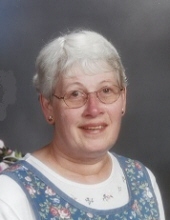 Marion F. Johnson,78, of Sheboygan, passed away on Sunday, January 27, 2019 at Rocky Knoll in Plymouth. She was born September 14, 1940 in the Town of Herman to Oscar and Roma (Spindler) Maeuser. She attended Kiel High School and was a member of St. John’s UCC in Sheboygan. Marion was a housekeeper at Sheboygan Memorial Medical Center retiring in 2000. Marion is survived by her mother Roma Maeuser, children; Timothy (Penny) Johnson of Sheboygan, Scott (Susie Oswald) Johnson of Elkhart Lake, David (Carol Thelen) Johnson of Plymouth and Donald Johnson of Sheboygan Falls, five grandchildren; Trevor, Alex, Drew, Derek, and Madeline, siblings; Joann (Royal) Henschel of Elkhart Lake, Charlotte Maeuser of Rochester, MN and Gene Maeuser of Town of Herman. She is further survived by nieces, nephews, other relative and friends. She was preceded in death by her father, and an infant son Daniel. A memorial service will be held on Monday, February 4, 2019 at 1:00 PM at Zimmer-westview Funeral & Cremation Care Center, W2132 Garton Rd. Sheboygan, with Rev. Gregory Whelton officiating. Inurnment will follow at Immanuel Cemetery. Relatives and friends may visit with the family on Monday, February 4, 2019 from 11:00 AM until the time of service at the FUNERAL HOME. In lieu of flowers a memorial fund will be established in Marion’s name. The family would like to express their gratitude to the staff of Rocky Knoll and the staff of Sharon S. Richardson Hospice for their care, comfort, and support. To send flowers or a remembrance gift to the family of Marion F. Johnson, please visit our Tribute Store. "Email Address" would like to share the life celebration of Marion F. Johnson. Click on the "link" to go to share a favorite memory or leave a condolence message for the family.